- A Cloud Drive directly accessible from Finder which provide a 'view' and download on demand of remote files. - A folder mapping Sync App to sync files off-line. - Search integration for quickly finding / sharing / downloading remote cloud files. - A Mac Mail plug-in that enables secure file links to be added to Mac Mail. (a similar toolbar option is provided for those who use Outlook or other Mac email providers). - Shell integration for file sharing and other actions. The virtual drive feature makes use of a technology known as OSXFuse which is installed as part of the setup. This is seamless unless you have MacFuse already installed. If this is the case then may be prompted to upgrade MacFuse before installing the Mac Cloud Apps. If you are using an existing App with MacFuse then be sure to choose to use the compatibility layer and remove the existing MacFuse installation. You can also check for later versions from the SME advanced tab accessible using System Preferences. 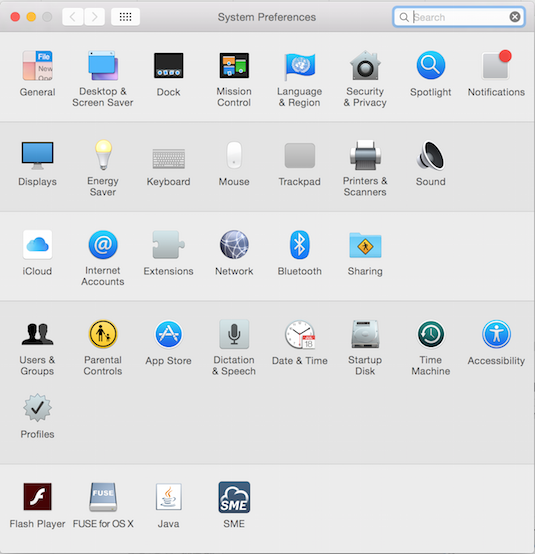 OSXFuse is an open source library to enable the development of Mac OSX file systems. You can find out more about OSXFuse here. The latest version of the tools is 3.4.5 R2 dated 2nd June 2016. The setup is available from download after web login from the Cloud Apps link on the right sidebar (for paid customers). As part of the setup we install a technology know as OSXFuse for the virtual drive element. You will be prompted to install this when you install the SME preferences pane, after double clicking to open the package file.. If you have a prior version of Fuse, you may be prompted to upgrade to the latest version. You can uninstall the tools from the uninstaller in the same DMG. Note this will remove the preference panel and all settings. 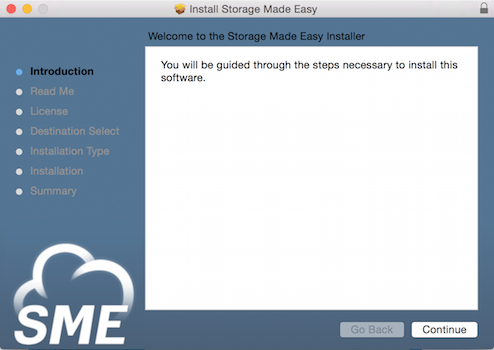 A Storage Made Easy account is needed to use the Mac Apps. When launched proceed to login using a SME username and password. Once logged in configuration options are available. The default provider lets users set the Primary (default) cloud provider for the cloud drive. 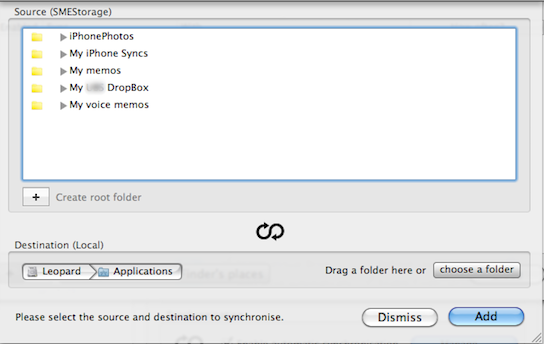 Synchronization can be enabled if offline folders are required. For further details on the Primary Cloud provider please review Top 5 things to know when using the Enterprise File Fabric. In the next few sections we'll cover what each of these options do. 1. if files are encrypted on remote Cloud(s) a decryption password can be entered to automatically decrypt on download. 2. For a secure connection to the SME Cloud Platform please ensure “run over https” is checked. 3. The API endpoint should never be changed unless instructed by SME Support. 4. Decide how want to handle file deletions on sync. There are three choices. 6. The 'clear virtual drive cache' resets the virtual drive cache. This can be useful if there are any 'ghost' entries or to reset the view. The 'Check Fuse Installation' button is a way to check and upgrade to the latest version of OSXFuse. 8. The “Stop all Tools” button forces all running tools and services to stop. Cloud to Desktop Sync enables files and folder from the Mac desktop to be automatically synchronised with remote Cloud(s), and vice-versa. If new files are added to local sync folders then these are sync'd up to the cloud when the next sync occurs. Similarily if files are added to the remote clouds, these are sync'd down. To enable Cloud/Desktop sync check the “Enable automatic synchronisation” checkbox. 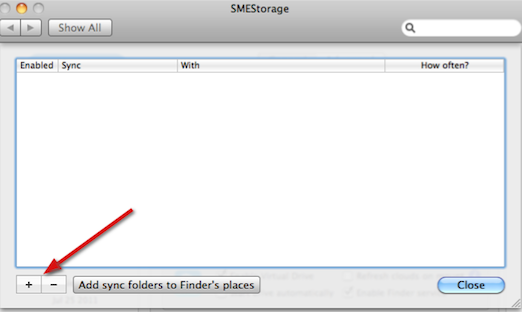 Once this is checked sync folders can be specified by clicking the “Setup” button. There are two modes for working with the Cloud Apps. One is to work with local files and have them sync'd back to the Cloud. The second is to work with files that are stored on the Cloud. Sync Folders represent the former in which users can map local folders to Cloud Folders and files that are stored on the desktop are regularly sync'd back to the Cloud. Clicking the “Setup” button for Sync takes users to the above screen. If folders have never previously been added users will need to click the “+” to map the first sync folder request between the cloud and the desktop. 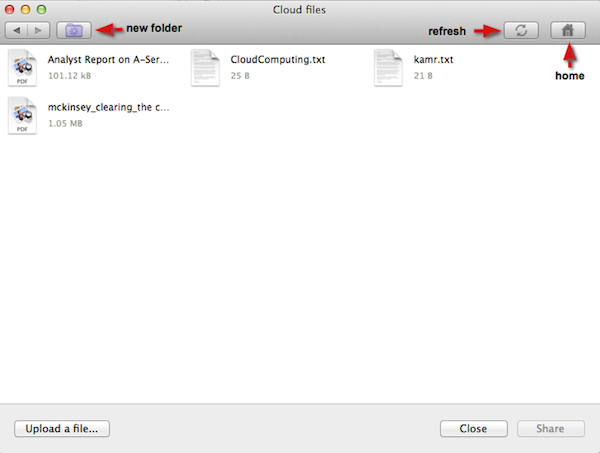 When adding a cloud folder to be synchronised with the desktop users should select the folders that they want to pair up. Ideally one of the folders will be empty (either on the cloud or the desktop), if they are not then users can choose to merge files. 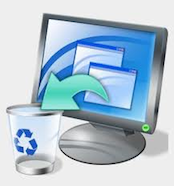 Users may think that they have selected an empty folder on the desktop or the cloud and still be asked merge files. Why ? There are often hidden files that users cannot see, which is why this message occurs. Once a folder pair has been added then all files from the cloud will be sync'd down and any files added later to this folder will be sync'd up to the cloud. This can be done with as many folder combinations are required. Users can also set how often the sync should be ran. Choosing “Often” runs the sync every 5 minutes and the other sync times are self-descriptive. 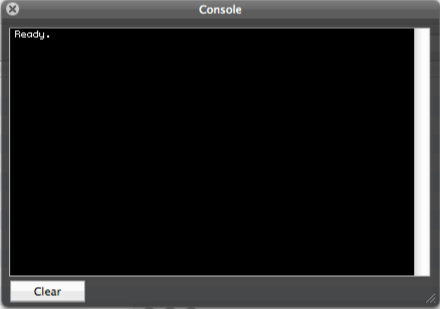 The Sync Console is available as a menu option so that users can see in more details what files are being synchronized. It also displays other logging information and can be useful to get a more detailed view of what is occurring in real-time. Other than using the Sync Tools and the virtual drive there is another mechanism to quickly 'drop' files for upload. Once you set an upload directory for quick upload files in the SME System Preferences panel you can choose to drag a file onto the sync icon and it will be automatically uploaded to the directory you set. After upload a sharing URL will be copied to the clipboard also. This can be useful if you choose to only use the Sync tools and not the drive and want to upload files quickly and get a shared URL. The Cloud Drive is a drive mount to files on different clouds. It is available directly from Finder and the command line and it presents a “view” of files that are stored on remote clouds mapped to an account. The Cloud Drive can be enabled from the system preferences panel. - Start drive automatically: Choosing this option will make the drive available on reboot. However if you don't choose it, that is fine, you can choose to mount the drive from the toolbar. 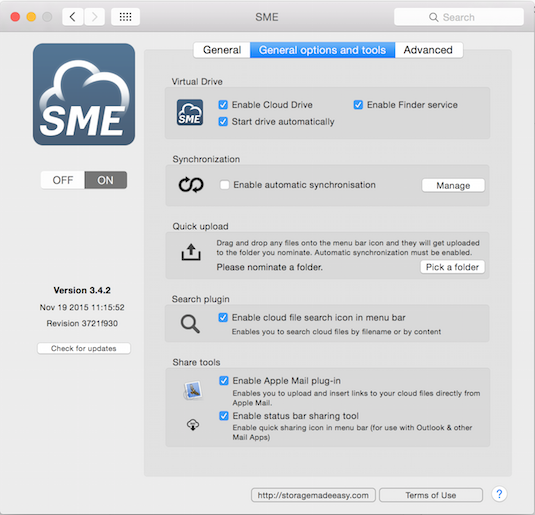 - Enable Finder Service: Choosing to enable the SME Service enables right click options so that you can perform actions on files from within finder. See the Cloud File Actions section for more details. When the preferences panel is “On” and then closed, the drive is mounted if automatic mounting is checked. Otherwise the drive need to be mounted manually from the toolbar. The drive will initialise and then mount and the status of this will be displayed to the user. 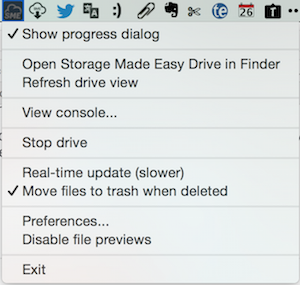 Once mounted a new finder window that displays the drive, and the drive may appear on the Finder sidebar depending on the version of OSX. If it does not appear on the sidebar you can simply drag it to devices and a shortcut is created. The first time you access a cloud directory, especially if there are many files in a directory then it can take time to create the initial view.After this the view is cached and navigation should be fairly instant. Note: The Mac OS also treat files that have “.” in their name differently. It does some extra parsing to check whether they are applications or not which can take some extra time. 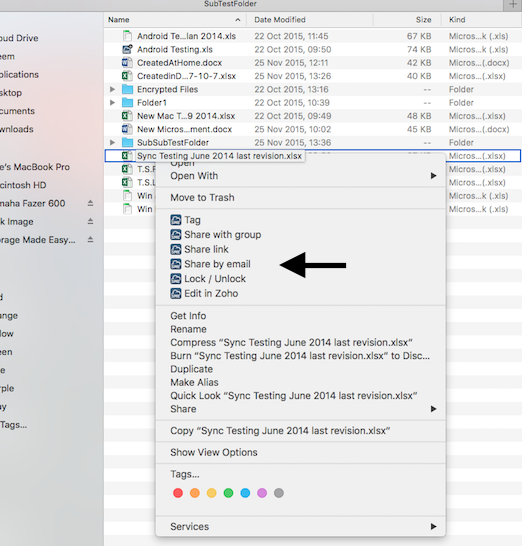 Note: The Finder can request that some files are downloaded as it needs more information to do its indexing. This is outside of the control of SME and such files are then cached locally. Note: If you have files you have encrypted on SME the same decryption password will be used for the drive as is used for the sync which you can set in the preferences panel. - Refresh drive view: Refreshes the meta data on SME with the underlying primary Cloud. You should not really need to use this as SME will automatically do this every 10 minutes. - Real-Time update: Rather than using caching it turns on real-time updates which means each data stream is pulled in real-time from the end provider for each call. This will be significantly slower than using the drive in normal mode. - Move file to trash when deleted: Lets you decide whether files you delete are instantly deleted on your mapped cloud or moved to the SME Trash folder, in which case they are not removed from the underlying cloud until the Trash folder is emptied. User will see a status in the top right hand side of the screen as to the current status of the files being uploaded and also how many files remain. If users quit the OS session before all files are uploaded or have a crash next time users mount the drive the files will continue to be uploaded. If the network drops or the mac is closed again the drive will auto-mount and resume the upload once the network re-connects or the mac is opened with a network available. Users will sometimes see the Cloud Drive refreshing the local cache it keeps of any files downloaded to ensure the latest versions of the files are either uploaded or downloaded from the local cache. Menu Bar Search can be added by choosing to enable it from the SME system preferences. Once enabled all data can easily be search and subsequently shared or downloaded from the Mac Menu Bar. Once the virtual drive is enabled and mounted enable special Finder services are available on right click for Cloud Files. The Mail Plugin can be turned on from system preference→SME. A new icon is added to the new mail messages or reply mail messages toolbar that enables the user to send secure links instead of files. For Outlook or for other Mac Mail clients then the status bar sharing tool can be enabled from the System preferences. Once the SME icon is clicked users can choose to pick an existing file and generate a link or upload a new file which after completion inserts a link. There are icons to refresh the view, take the user to the root folder (home) and also to create a new folder. 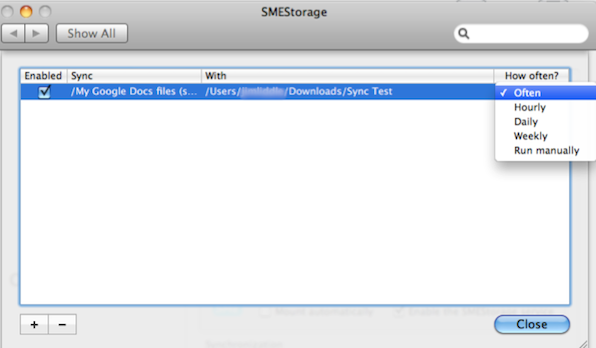 By default the last view the user opened will be the view shown when the SME file sharing icon is clicked. 2. Add a password: This will take the user to a page where the must enter a password before the can download a file. Many users want to treat the Cloud Drive as they would any other drive. That means choosing to preview files, and double click to edit files for example. This is fine, you can do this and, for example, when you preview a file the file will be downloaded and cached locally. Editing documents should also work in most cases. Applications like MS Office on Mac, for example, have to be explicitly coded for as they implement locks and temporary files that don't naturally fit well with offline Cloud Storage. If you do come across an App that you have issues with, please contact us and we'll do our best to support it. 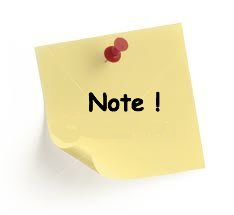 Note: For Omnigraffle files saved directly to the drive users must select to the file as a flat file as by default the Omnigraffle file is save as a folder structure which works fine on local Mac Drive's but not on remote networks. Due to the way in which OS X handles thumbnailing, the only view currently enabled in the drive is tree view. This prevents excessive downloading of content, reducing bandwidth. If you switch views then due to the way the Mac OS works it will try and download files or elements of files to create a thumbnail view and this can cause excessive download and slowness in loading. You can uninstall the tools from the uninstaller in the same PKG. Note this will remove the preference panel and all settings. Then the files may not be uploaded. Many Clouds actually don't give a rejection response in their API for such files so although they may appear to upload they will not be uploaded. Please ensure you don't use such characters in filenames that you wish to store on the Cloud. Warning: If you are in icon view rather than list view Finder pulls down data to build the icons. This can take longer to view the file lists until this caching is done. Also note that Finder may download some file types on demand if it requires further information about them. This is an idiosyncracy of the Finder in Mac and it affects very few file types, but if you have this problem you can zip the files in question to prevent this occurring. OSXFuse: It is not unknown for OSXFFuse to crash. If you experience this problem you can stop and restart the tools. You should also check whether you are running the recommended version of OSXFuse and also whether you are running the latest version of the Cloud Tools. Anti-Virus: If you are using anti-virus software with the Mac please make sure to exempt the SME Mac Drive location otherwise the performance will be slow and in some cases this may cause crashes. The drive provides a virtual view, there are no real files there and so the anti-virus makes remote network requests to try and access and dowlnoad the files for virus scanning which negates the whole purpose of having such a cloud drive. Other FUSE Based Apps If you use any other FUSE based Apps that use a different version or different FUSE bases subsystem then this may conflict with the Drive. Any file you move from the drive to a local location can be scanned still if only the drive is exempted from any anti-virus software.